Review of “Hot Chocolate” – Anthology by four fabulous authors! Abigail’s handsome boss, Max, wanted her to find him a wife! Them a sip of delectable love potion made Max fall for his lovely assistant. But was his love forever or fleeting? Brenna’s fudge recipe was a huge hit at her cafe, and tycoon Hayden Garrett wanted it – and Brenna. But how far would he go to make them both his own. As the front cover proclaims, this collection of short stories are “sweet, steamy, and very satisfying”. For anyone who loves chocolate, I’m sure you’ll be craving a sugary treat after reading any of these stories. For me, I was most definitely thirsting for a a hot cocoa. 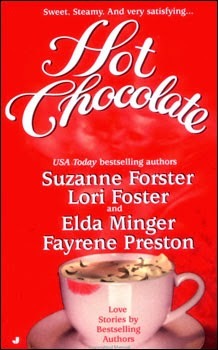 And speaking of hot cocoa, I’m totally going to try the recipe Elda supplied to her readers in “Buried in Her Heart”. It sounds delicious!